Here's a quick case of another of Angie's projects that I used for club night. Can you tell that the Caribbean Cruise was on my brain and that I couldn't handle much else? As my mom and dad are at our house taking care of my little angels, I decided to put an F on this one for my mom's name. This will definitely have a gift card in it for her when I get home! The challenge this week over at Stampin' Royalty is to go punch crazy. 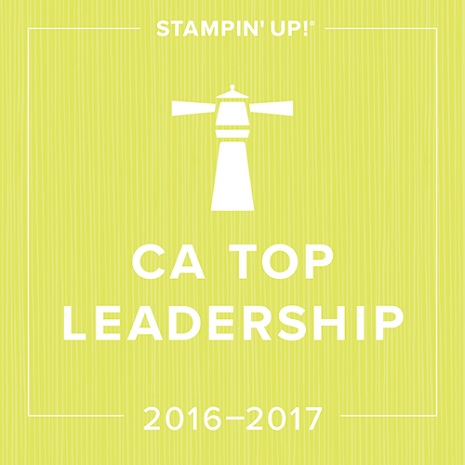 Make sure to head over to Stampin' Royalty today and check out the fabulous cards by the other design team members. There is some serious talent there... I am definitely punch challenged! I do however love this colour combo of Rich Razzleberry and Basic Gray! I don't know about you... but when I'm stuck for inspiration, I hit the catty... this was a quick and easy one! My next one will definitely involve a cool technique that I've seen out there... dyeing the fleurettes with reinkers! I don't know about you, but I will be REALLY sad to see the Occasions Mini end on April 30th! I loved the idea of the Sweet Pea DSP stack... a whole stack of coordinating DSP... what's not to like! I also loved the addition of some fabulous new embellishments in the mini, including the Sweet Pea Stitched Felt. This was a card that I cased from Pam Speidel that was the inspiration from my Sweet Pea Card Kit. I loved how the felt was the focus! If any of these products have been on your "list" make sure to get them before April 30th! Not only will you beat the deadline for the mini, but you will also get to take advantage of my sale above! This card was a CASE of one made by an amazing friend of mine... Angie Juda aka Chic n' Scratch! I was changed up the colours... I was feeling a little sad about losing my Ruby Red and Cameo Coral and wanted to give them some love:) We made it for club this month... such a cool technique and an opportunity to give my lonely pastels some love! Every time I pull them out I wonder why I don't use them more! It's funny that Upsy Daisy was one of my favourite stamp sets when I purchased it, and I don't think that I've used it in the six months. Now I've done two cards with it in the past week:) I really wanted to share the Black Magic technique with my club girls this month, and I thought that this would be a fun stamp set to try it with. I got my Summer Mini Pre-order items a couple of weeks ago. From the moment I saw the Mini I knew that there was one card that I was definitely going to be re-creating! I took one of the cards and altered the colours slightly to showcase our current In Colours as they near the end of catalogue life... at least some of them:) This is such a great stamp set to play with the kissing technique. It is such a simple technique, but one that I've never even taught at club. I love that the ice cream looks so realistic with this technique. Well club ladies, this is one we're working on tonight... I hope you like it! This card is a case of fabulous card that I saw made by Regina. It is a little hard to see with the white on my white backdrop, but I love how clean it looks. I definitely like Regina's better... but I was trying to give some love to my soon to be retiring colours. I used Orchid Opulence for the frame on the and then ran it through the new Square Lattice Textured Impressions Folder. Before I sponged in my colour, I stamped my image using White Craft Ink and then embossed it with clear embossing powder. This is for the Stampin' Royalty Challenge this week, KISS (Keep it Simple Sweetie). That is a much more polite way of using it. When I was in university finishing my teaching degree, we used to call it, Keep it Simple Stupid! I guess Sweetie is far more encouraging:) I really enjoyed making this card... quick, easy, and clean! 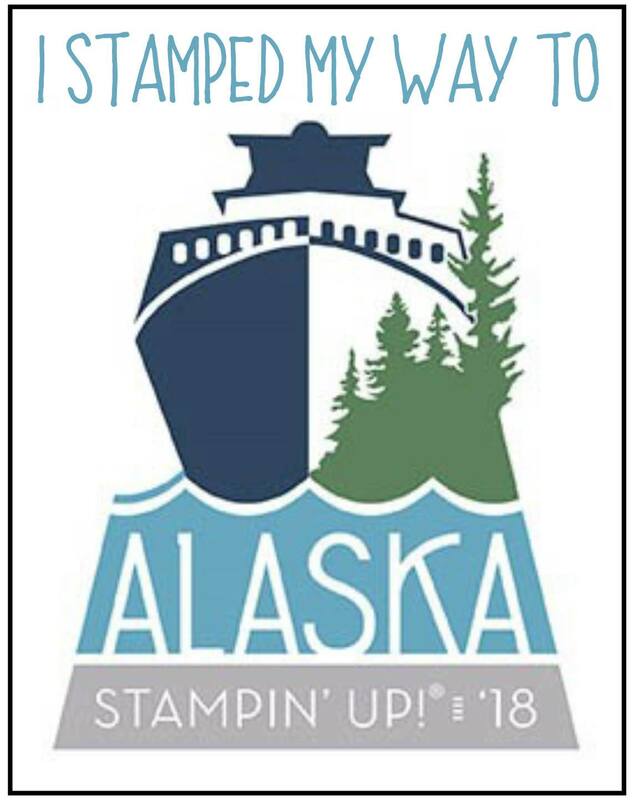 Don't forget to jump over to the Stampin' Royalty blog and check out the projects from the other design team members... we can't wait to see what you come up with! Here's another page from my Digital Studio scrapbook frenzy last weekend! I don't know about you, but sometimes I start a card and don't know how to finish it. This card has been sitting on my desk for quite sometime (notice the retired DSP). I never quite figured out the stamped image that I wanted to put on it. When I got to the point that the image was missing, I realized that it was far manlier than I was expecting and I couldn't find "just the right stamp". When my new Motorcycle stamp arrived on Friday it was the first thing to cross my mind:) I'm thrilled with how it finished the card and didn't even need any watercolouring, although I can't wait to try that with this stamp as well! Only 19 more days until this beauty is available in the new Summer Mini! Today was an absolutely AMAZING day with my family! My eldest son has been waiting to start baseball since he was able to swing a bat. By the time he was 2 1/2 years old, we were pitching to him and he was able to hit a ball out of the air. When we explained to him that his first year was going to be T-Ball... he was a little hesitant, but he embraced it full force today! 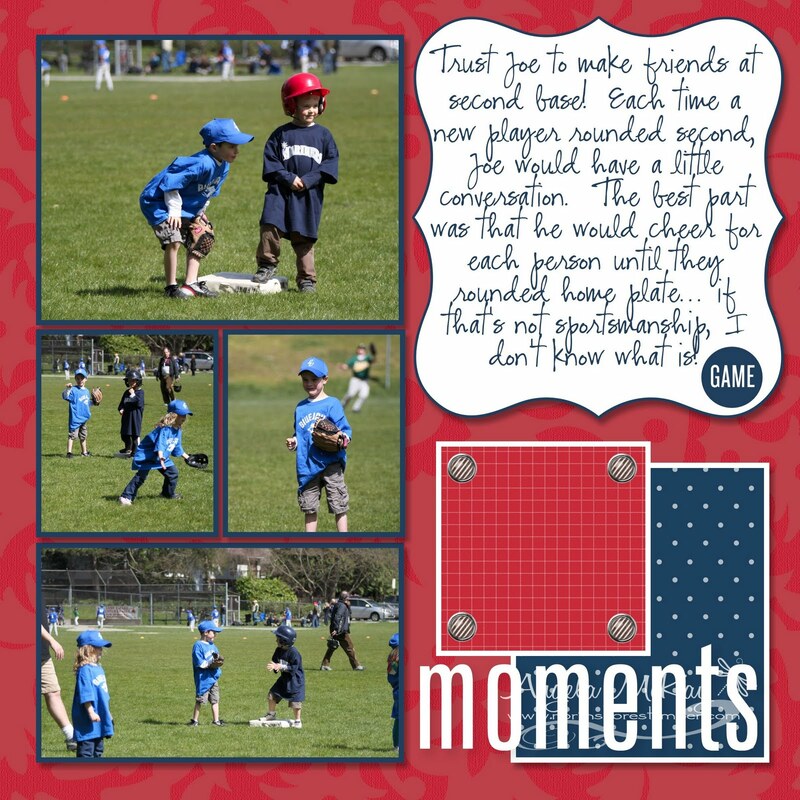 I felt my chest bursting with pride and I was fighting back tears as I saw him hit the ball and run the bases today! His smile could been seen from across the field. 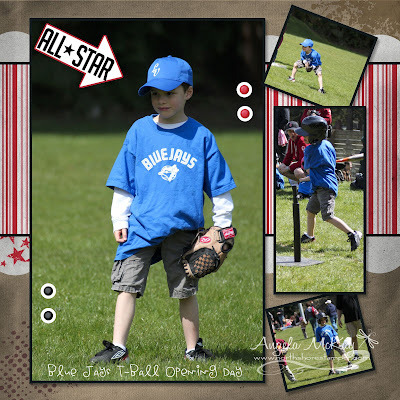 It is such a wonderful feeling to see your child enjoying a sport that he ABSOLUTELY loves! What a difference from the lack luster attitude we've seen towards other sports:) Check back tomorrow for another page... I was on a roll tonight! Focus On Flowers Card Kit Available in Limited Quantities! I now have my Focus on Flowers Card Kit available in LIMITED quantities. There will be five initial kits that I will sell off and the remainder will be determined if there is a waitlist from the initial offering. You will receive all cardstock and embellishments necessary to complete this project with the exception of stamped images. As I have left the only stamping necessary to be added in, the sentiment, you can choose whatever you'd like from your stash at home or choose to leave them without a sentiment to use for any purpose. You will also receive a PDF file with pictures of the all the cards and gift bag as well as detailed instructions for assembling each! Unfortunately I am only able to mail these card kits in Canada. 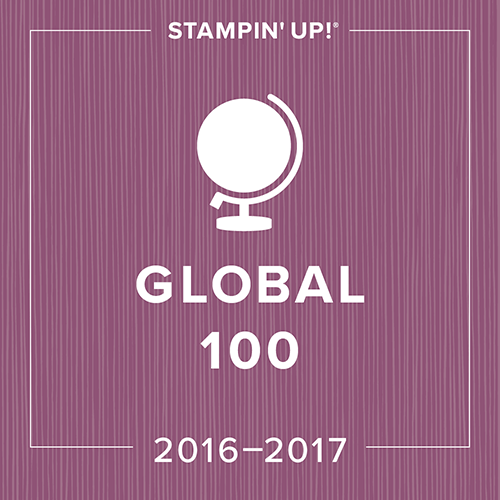 Anyone familiar with ordering from Stampin' Up knows that a man in a brown suit is as good as Santa Claus! My UPS man even gets a Christmas gift! For the amount of time that he spends delivering parcels here I should probably be inviting him to Christmas dinner:) Anyway... I knew that I had a few amazing packages arriving today... my preorder from the new Summer Mini which launches May 1st! I was waiting at the door as ALL FOUR packages were delivered! Downstairs I went! It's funny, but when I found out about the Colour Renovation the other day... I will admit that I did not cry a tear over the lost Bold Brights. They have never really sparked my creativity. Isn't it ironic that today, with the new Textured Impressions Square Lattice Folder and this adorable stamp called, "Birthday Block" that the first thing I thought to use was my Bold Brights! It felt so summery to me! Isn't that texture amazing????? I had so much fun creating this page today! Awful to say... but it was in my head all day! Check out my blog post on all of the new releases! 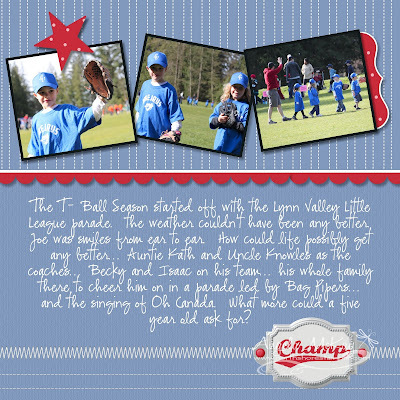 When it comes to card making, I'm still really learning about the Vintage look, so it was so much fun to play with digital stamps that instantly made the page look vintage! My neice is always such an easy subject for a girlie page... really she's my only subject for the girlie pages! I have two neices, one who is not quite 2 and the other who is almost 6. One is from my side of the family and one is from my hubby's. Although they both have those little, blond, angel ringlets, the older of the two is more likely to be caught in her hockey gear scoring a goal! I was so excited to see how the scallop trim corner and scallop trim border punches worked in MDS... they were a breeze and I could simply adjust my photo to fit perfectly! These are a MUST! This was my card for the Stampin' Royalty colour challenge this week... what a tough one! It was Taken with Teal, Tempting Turquoise and So Saffron. I find that when I'm stuck with a colour challenge, I really have to draw from my DSP for help. Make sure to go and check out the fabulous projects created by the other goddesses... I'm always in awe of what everyone comes up! 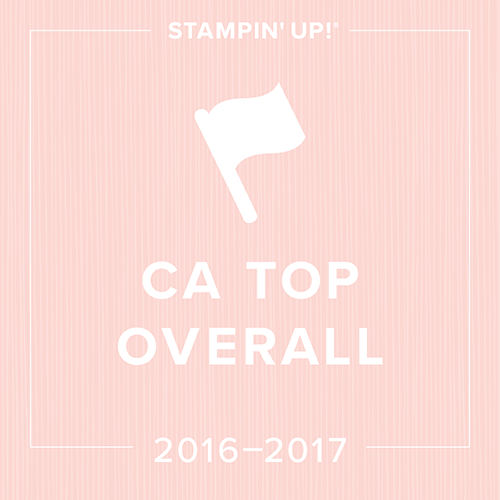 Stampin' Up made the hugest announcement today... a Colour Renovation! What does this mean you ask... Baja Breeze is back... does anything else matter?????????? teehee. 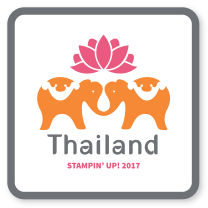 As of July 1st, there will be five new colours in the Stampin' Up family...okay... stop jumping up and down and screaming... there's more! Ten previous In Colours will be returning! For those sticklers out there who pay attention to EVERY detail... you're going to count 6 new colours, but I've got you there! Crumble Cake is just the name that Kraft will be taking on as of the new catty! If you look at the photo above, you'll notice that the names of the colour families have changed as well... in fact they won't even be called colour families anymore... they are now called colour collections. You'll also notice that there are a number of colours gone from the old colour families. I was a little shocked at first, but the more I looked, the more I realized that the colours that have disappeared are the colours I use least. I guess I'm not alone! In addition, information on the 5 new In Colours will be released in June! Want to get hold of all of these products early? The only way is as a demonstrator! If you've been thinking about joining, now is a perfect time! It will give you early access to all of these fabulous new colours... just imagine the new accessories to come too! I would love to have you as part of my West Coast Creators team as we head into this exciting transition! Watch for more info in the weeks to come! 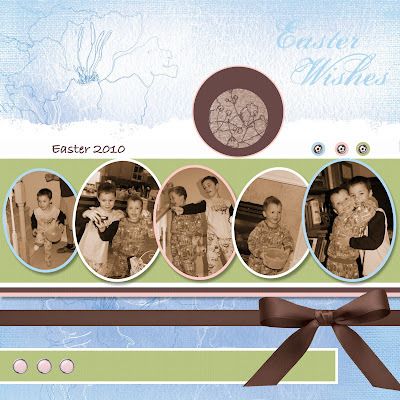 Punch up your My Digital Studio projects with eleven new downloadable images from Stampin′ Up! You'll love these new punch images and stamp brush sets, and they’ll make a perfect addition to your My Digital Studio library. Use the search keyword DWNLDA in OEX to see these new images, and place your order today! I know that people become Stampin' Up demonstrators for a number of different reasons. We all have our stories. Mine was one of necessity, or at least it became one shortly after I joined. I signed up because I wanted a discount... then I needed to make some extra money for my family. Where I am now, is a place that I love. It is not out of necessity anymore.... it's all about the AMAZING friendships that I've made. I am so thankful that SU enabled me to do what I needed for my family when it was necessary, and I'm so thankful for all of the fabulous downline, upline, sideline, and more importantly customers who are now my friends. This gorgeous card was one sent to me by a super sweet friend, Jennifer, who is one of my customers. I did a workshop at her house a few weekends ago, and for some silly reason, she sent me a thank you card! She was the one who let me into her house to meet her friends! Isn't this card gorgeous? Major talent here! 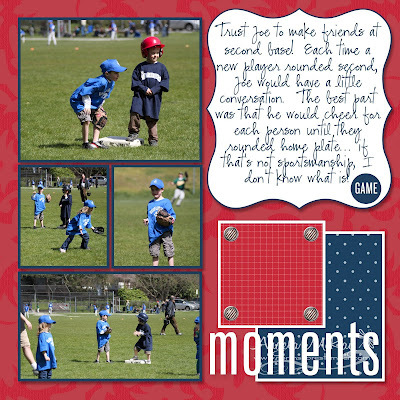 The second card was done by one of the most fun people I know, Sabriena Satchwell, one of my downline! This was a birthday card she made for me this year. A little embarrassing to admit, but she had to include post it notes inside for me so that I understood how to open this "fabulous folds" card! 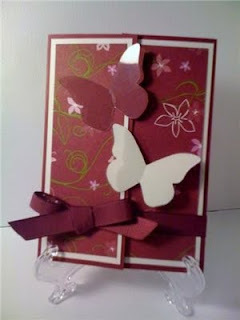 Check out her blog post on this card to see how to make one for yourself! 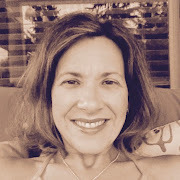 Thank you to everyone, whether it is your cards, emails, and your blog comments. I know that I've never even met some of you, but it is amazing how well I feel like I know you all! Thanks so much for all of your support throughout my endeavors with this business! 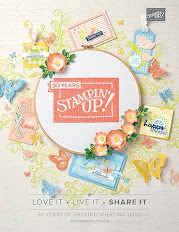 Special Offer DetailsFrom April 1-May 31, join Stampin' Up! as a demonstrator and receive two FREE technique DVDs (2007-2008 and 2008-2009 Workshop Wow DVDs). Sampling of Workshop Wow presentations from Stampin' Up's 2008-2009 regional seminars. Includes 19 demonstrator presentations of "WOW" techniques. Sampling of Workshop Wow presentations from Stampin' Up's 2007-2008 regional seminars. Includes 18 demonstrator presentations of "WOW" techniques for use in preparing for workshops. This incentive available to all new recruits (first time joins, rejoins, etc.). Free Workshop Wow DVDs will automatically ship with the new demonstrator's Starter Kit. This special offer is good for both the standard Starter Kit and the Digital+ Starter Kit. To join my AMAZING West Coast Creators time... click here and then choose "Join Me" in the bottom left hand corner. You will need to enter my password to continue, "scrapaholic" (not in quotes). Two-Step Into Spring Promotion is On Now! In celebration of this exciting sale, I thought I'd better get my Trendy Trees stamp set out and give it some love! Watch for samples with the other three coming up! Host a $460 workshop and receive the brand-new Two-Step Awash with Flowers stamp set FREE! Two-Step into spring with a sneak peek from the 2010-2011 Idea Book & Catalogue! Be the first to add the Awash with Flowers stamp set to your collection. 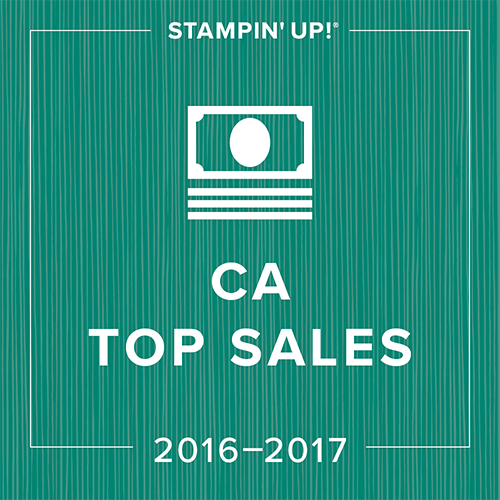 Plus, purchase spring-themed Two-Step Stampin' sets at 20 percent off the retail price--no additional purchase necessary! Here's the little gift bag that I mentioned yesterday. 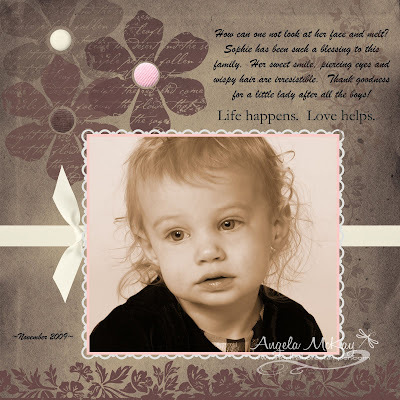 I love that DSP (Sweet Pea Designer Paper Pad) !!!! It will be part of the Class-at-Home kit...make sure to leave your feedback as one comment will be chosen as a winner of their own kit. Remember, I am only able to sell these kits in Canada. Watch for purchasing options this weekend! Upcoming Class at Home Sneak Peek!